The successful uptake of any technology is, of course, dependent on the cost of production. One thinks of the cost advantages achieved by the development of knitting machines in the 16th century and the technological advances of the industrial revolution. Electronic textiles or microchip technology in textile materials are today relatively expensive, but there are good reasons to believe that with improved technologies, costs will be driven down. Textile clothing has always been multi-functional. So, a shirt might provide warmth, demonstrate one’s status, or be somewhere to keep one’s pen. Over the centuries, technologies have developed to enhance functionality. Major developments have been the introduction of synthetic fibers, advances in breathable waterproof fabrics, and easy care properties together with specific functions such as impact protection or flame resistance. Early electric and electronic textiles had components added to existing garments. Later, functionality was added by incorporating conducting yarns into fabrics to produce sensors, switches, and actuators. Over the last century, speculative patents started to appear with some early products such as the electric blanket. In the 1990s, there was a surge in research interest in the field that has led to the development of a range of electronic textile products, particularly over the last decade. However, many of these still rely on the addition of electronics to existing garments or on the production of specialty products such as arm or chest bands. 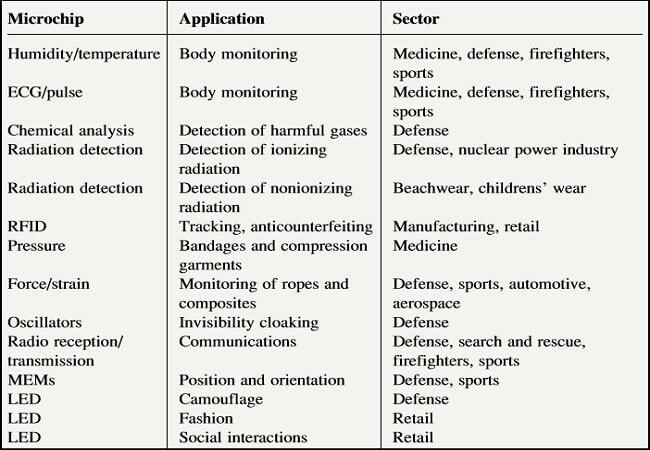 By using the approach described above where semiconductor chips and associated interconnects are incorporated within the fibers of a yarn, a commercially available thermistor was incorporated to produce electronic temperature sensor (ETS) yarn. The ETS yarn enables the temperature at a defined point to be determined. It is, therefore, possible to achieve a temperature distribution graph by incorporating ETS yarns in predetermined locations of a knitted sock. The resolution of the temperature distribution will depend on the number and positioning of the ETS yarns in the textile structure. The miniature size of the thermistors will ensure that the electronics remain hidden from view. To construct the yarn, thermistors (Murata NCP15XH103F03RC, NTC) were soldered to single-stranded copper wire of 100μm diameter using a reflow workstation. The thermistors and interconnects were then encapsulated with a polyester carrier yarn (two 167dTex/48 polyester yarns) to form a micro pod using an UV-curable polymer resin. 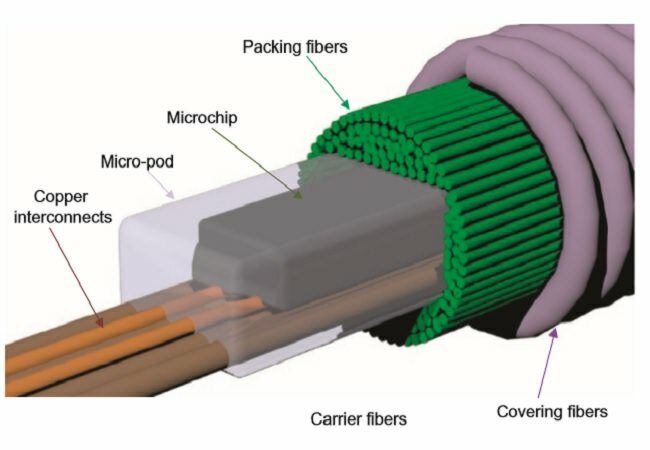 Finally, the carrier yarn and interconnects (fine copper wire) with micro pod were covered using packing fibers and then incorporated into a warp-knitted fabric tube to form the ETS yarn of 1.7 mm. 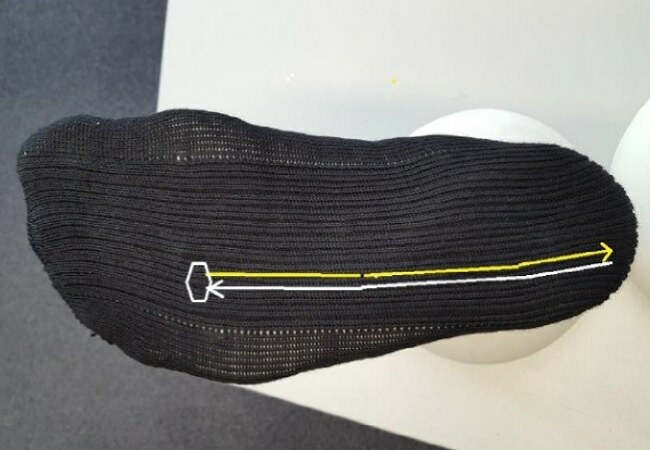 New technology (microchip technology in textile materials) was developed to produce a seamless knitted sock with 2.0 mm diameter channels in the sole on a modern computerized flatbed knitting machine from Shima Seiki, Model SWG 091 N3, and 15NPI. The ETS yarns were inserted into the channels manually, and this allowed the thermistors to be positioned accurately in the sole of the sock. It was necessary to develop the technique of producing socks with channels as currently ETS yarns can be produced in small quantities. You may follow: Why CAD and CAM Technology is Important in Apparel Industry? As with all knitted materials, the structure relaxes and shrinks in size after manufacture and may then be stretched when worn. 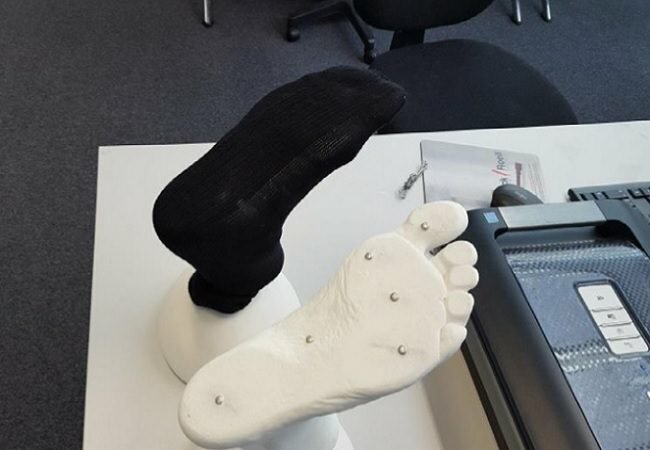 Therefore, in order to ensure that the sensors are correctly placed when worn, a simulated foot with metal studs as location markers was created. 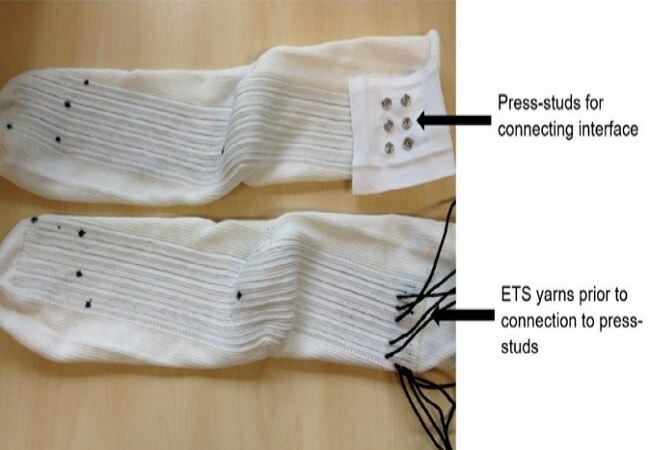 Five ETS yarns were integrated into the channels of a knitted sock to develop a temperature sensor socks. The resistance of the thermistors was determined with a potential divider circuit by using a USB 6008 DAQ unit from National Instruments connected to a PC. The values of the resistors used in the potential divider circuit were determined with an Agilent 34410A 6 ½ Digital Multi meter to a precision of 1 Ω. Software was developed in Lab VIEW to read the resistance of the five ETS yarn. The corresponding temperatures are determined from the resistance-temperature conversion equations provided by the thermistor manufacturer. The results were saved onto a spreadsheet. Body temperature, in arguably, is one of the four main vital signs that must be measured and monitored in a patient. The revenues of wearable medical devices, which were US$2.8 billion in 2014, are predicted to rise to US$8.3 billion by 2019 according to the market analyst firm Mordor Intelligence. A recent study done by researchers from the Polytechnic University of Madrid (Thomas, 2015) has revealed that patients have a strong preference for wearable’s, like the technology developed for the project that remain hidden from view. In medicine, temperature is an established biomarker of infection in wounds. Temperature could also be used to manage the occurrence of foot ulcers in diabetic high-risk patients. Devices that are traditionally used to measure the body temperature are, namely, mercury thermometer, digital thermometer, chemical thermometer, and infrared thermometer, which give measurements more of a static nature and not always geared for continuous ambulatory temperature measurement. Wound care has become one of the leading health challenges in the 21st century, and the cost is expected to escalate to an annual $20 billion in the coming years. Chronic wounds require frequent dressing changes, an activity that creates a burden in terms of health-care costs, nursing care, patient outcomes, and hospitalization time. There will be significant reductions in costs of electronic textiles or microchip technology in textile materials as many textile manufacturing processes are automated. Products will be developed that are based on smaller semiconductor chips with resultant finer yarns and finer fabrics. There will be advances that will allow the integration of more complex functionality with greater intelligence. These developments are likely to be enhanced by advances in electronics based on grapheme. Grapheme offers high-strength and outstanding electric properties and may be set to replace silicon in electric devices. IBM, Samsung, and Nokia are already investing in grapheme technology, and this is likely to have matured by the late 2020s. The technology offers potential for further miniaturization of embedded electronics. What is microchip technology in textile? What do you mean by microchip technology in textile products? What are the importance of microchip technology in textile? Describe the future of microchip technology in textile materials. Explain microchip technology in textile with its applications. Why microchip technology is so important in textile industry? what are the benefits of using microchip technology in textile and apparel industry? Mention some benefits of using microchip technology in textile materials. Point out some negative impact of microchip technology in textile materials. Mention the development of microchip technology in textile industry. Category: Garments Production Tags: Electronic Temperature Sensor Yarn, Electronically Functional Yarns Application, Microchip Technology Future in Textile Materials, Prototype Temperature Sensor Sock, What is Electronic Temperature Sensor Yarn? This is truly amazing! Textile technology has advanced a lot. Incredible to learn about microchips in textiles. Some thing new and unique for us merchandisers to think about.